4th of July, Birthday Cake, and a Contest! My garden tomatoes were beginning to ripen and, at the same time, a heat wave was beginning to break. This seemed the perfect storm for sandwiches and tomato soup. I haven't had a good tomato soup in a long time. The boxed variety is either not very good or not very vegan and every restaurant version has either cheese or cream or both. So, I set out to make a simple tomato soup: one with simple ingredients, one with good flavor and one that has an appealing color. So I chopped up a few tomatoes, added onions and garlic, tossed with olive oil and roasted the lot. A little tomato paste added some depth to the color and some basil made it pop. I'm so happy I can have good tomato soup again. Preheat oven to 450 degrees. Roughly chop the tomatoes, pepper, onion and garlic. Add to a 9 x 13 casserole and bake on the top rack of the oven until the onion begins to brown, about 30 minutes. Turn every 10 minutes or so. Add all ingredients (except salt) to a blender, in batches and thoroughly blend. Bring to a boil in a sauce pan. Season with the salt and cracked black pepper to taste. If not for tomato soup I may not have survived my first few years away from the parental nest (many, MANY years ago). 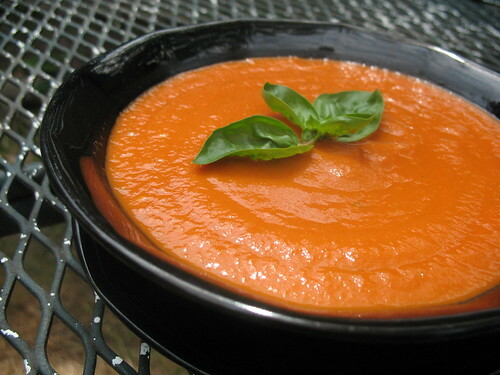 As such, it is my firm conviction that tomato soup should be elevated to a sacrament (this from a Catholic expat of untold years). Due to a rather lazy planting schedule, my own tomatoes are just beginning to ripen, but several will probably be bound for this recipe, thanks! This recipe seems very good and I can't wait to try it. I have never baked a soup!